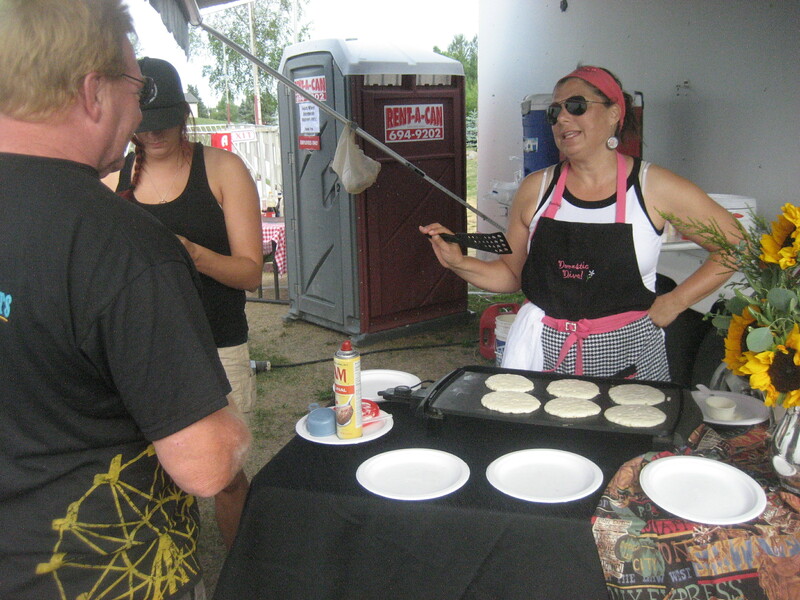 Co-owner of Golden Wheel Amusements Jacqueline Leavitt makes pancakes for the crew at the Bear Paw Festival in Eagle River, Alaska last July. No great carnival exists without great carnival food and showmen cooks. Same rings true for X Banner Stands and flags! When Flash was a young man in carnivals he walked by a gypsy woman who looked up and cast a spell on him. “An old gypsy woman told me, ‘Sell hot dogs and hamburgers you’ll make a lot of money’ and she was right,” Flash said at the Showtown restaurant in Gibsonton, Florida, aka Carnytown USA. At his peak, Flash said he ran “seven or eight” food wagons. He’s retired these days with property in Gibsonton and in Pennsylvania, where he owns several more businesses. Flash based his career on those prophetic words. He prospered, raised his kids on the road and named his daughter after the gypsy woman. However, carnival food is both food for the marks and the carnies. 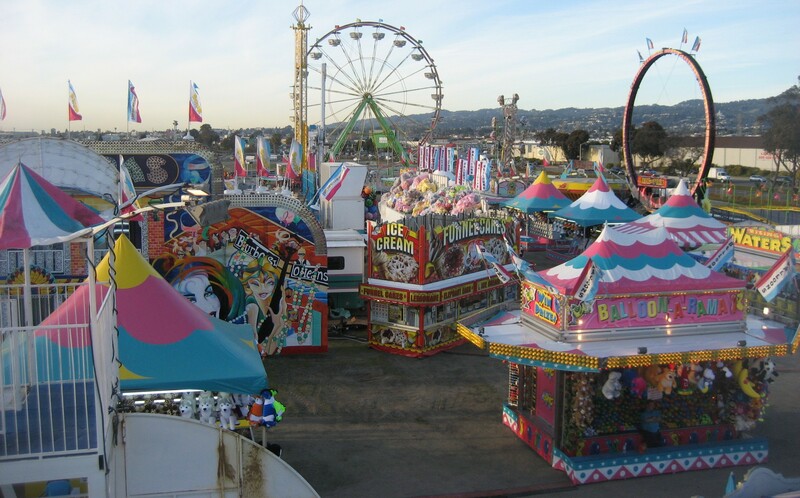 In some carnivals, food wagons are still be called grab joints, grease joints and choke & pukes. Traditional carnival wagons sell Elephant Ears, cotton candy, funnel cakes, nachos, pizzas, hot dogs, hamburgers and fried foods like deep-fired Twinkies and Snickers. Kelly Wilson, the carny philosopher king, works in a Mexican food wagon, of which there are many along the border of Mexico. Carnies often get a discount from the wagons and word spread up and down the state fairs when a booth has cheap food. Some carnivals set up commissaries. When I worked for Butler Amusements in California, the food wagon had hot egg and sausage biscuits for breakfast and other microwaveable dishes. Butler hosted a surprise Easter brunch for us in Martinez, California. On the throwing counter of a balloon-dart game, the buffet featured plates of ham, salami, turkey, American cheeses, potatoes, pasta salads, cookies and Easter eggs. Easter brunch in Martinez, California. On training day at Classic Amusements in Hayward, California, owner George D’Olivo grilled steaks, burgers and hot dogs served with pasta salad, deviled eggs, salsas and sodas. The owners of Golden Wheel in Alaska served an elaborate pancake breakfast in Eagle River before the start of the Bear Paw Festival in July. After a day of river rafting along the Chena River in Fairbanks before the Tenana Valley State Fair, the owners paid for anything you wanted eat a local restaurant. Golden Wheel employed J-1 visa workers, students from abroad. So foreign workers tended to eat the fare from their home country, Chinese or Eastern European. One night a carny named Breeze bought and cooked his mother’s Irish corned beef and cabbage stew for the whole crew. Golden Wheel and Classic also had full kitchens in their warehouses. Mexican carnies, the majority of the workforce in bigger carnivals, tended to eat food bought at the local mercado. 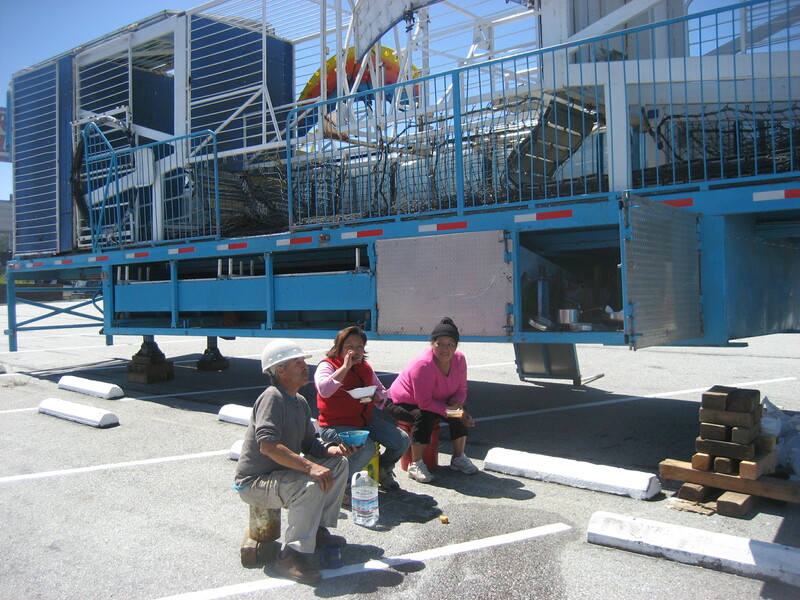 The men pooled their money and the women bought the food and cooked it on outdoor grills beside the carnival trailers. Mexican workers eat a meal cooked from pooled wages. People sat on plastic buckets or on the doorstep of their bunkhouse to eat their plates of food. The carny quarters, particularly in the Mexican barrios, can look like a long outdoor restaurant. When I started in the carnivals, I thought the Jarochos, those from the state of Veracruz, would be eating more fish because their state borders the Gulf of Mexico. But their hometown Tlapocoyan is inland and they ate a meat-based diet, which was also rich in vegetables and beans. I worked games for Adam West at the state fairs in Minnesota, Oklahoma and Texas and before each fair Adam brought the crew out for a free dinner at a decent restaurant. In Minnesota, he combined his daughter’s seventh birthday party with a crew party at a St. Paul bowling alley. Beer, whiskey and cupcakes were served. 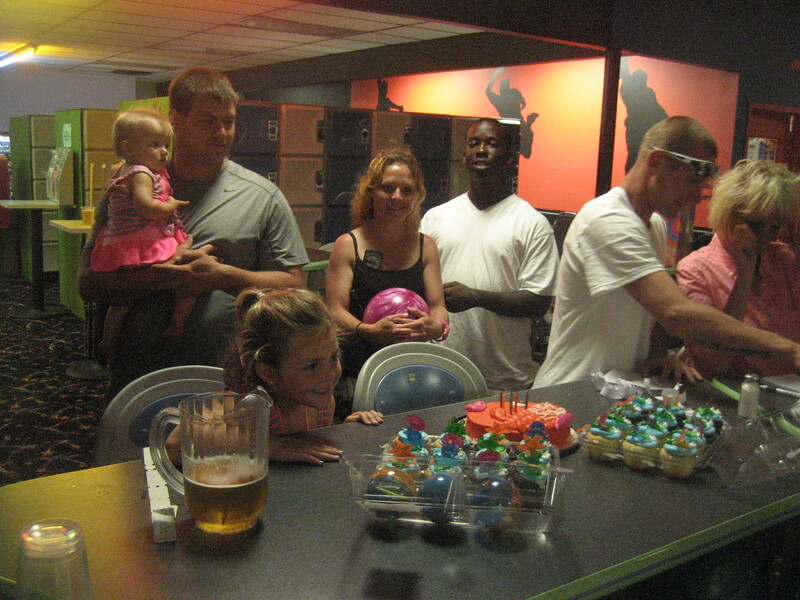 Carnival games owner Adam West with one daughter in his arms and another looking at her birthday cupcakes at a crew party in a St. Paul bowling alley. The Oklahoma State Fair had a lunch trailer for workers. The State Fair of Texas had a cafeteria, with Chef Specials which included Beef Stroganoff and Chicken Chow Mein. All the state fairs had food expos and contests. Often at the end of a spot, the food wagons would give out the last of their food for free. I was among those scurrying around like a street urchin for soft serve ice cream. In New York, New Jersey and Chicago there were no special food privileges, other than $1 pizza slices at the end of the night. In those spots, we were blessed to be near great food neighborhoods. In Chicago, I worked near a Harold’s Chicken Shack and bought food in the Puerto Rican Fest. New Jersey diners were my fare there. Flash made a handsome living off of carnies and marks eating in carnivals. While none of it can be called health food, carnival food is one of the most profitable facets in carnivals. Deep fried food and Ferris Wheels are signatures of American carnivals. The food can’t be bland, it has to add to the party. I was running the Lolly Swing in Martinez, California last March when a man came up to me and told me the smell of cotton candy reminded him of the best days of his boyhood in Alabama. Marcel Proust wrote about the connection between food and memories. When made along the carnival midway, carnival food is part of the show. Flash can still belt out a bally to bring in the customers. Fellow carnival owner Freddie Vonderheim, 76, balled out a bally in February at a Showtown breakfast with Flash. Along the midway, carnival food is the show and the cooks are showmen. Flash’s bally at Showtown was about carefree carnies eating breakfast on the road. I recently finished a year working in traveling carnivals and hitchhiking around America. I traveled 20,000 miles and crossed 36 states, Canada and Mexico. I believe my hitchhiking 15,000 miles makes me the #1 Hitchhiker in the USA this year. I’m currently seeking an agent and publisher for a book on the year.